Cambridge IGCSE is a 2-year international programme GSO has been offering since 2018. GSO is a registered school of Cambridge Assessment International Education. For further information about Cambridge and its programmes, visit the website. Successful completion of the programme will allow students to apply for the IB Diploma Programme Year 1 at International School of Talents Multicampus. Cambridge IGCSE is a two-year programme offered by CIE. The acronym stands for Cambridge International Examinations, a branch of the well-known Cambridge University, which has been dealing with International Certifications in several subjects for decades. IGCSE is the international version of GCSE – General Certificate of Secondary Education – the English programme that British kids attend during their first two years of High School. GCSE diploma is awarded at the age of 16. Its international version is one of the best-known programmes for students aged 14 and it is entirely taught in English. The aim of this curriculum is consistent with Cambridge philosophy: to “develop an informed curiosity and a lasting passion for learning”. Exams take place at the end of the two years and are externally marked by Cambridge. Students sit the exams at school in May/June or October/November, depending on the calendar of the school. Each subject is assessed through an independent exam, whose composition may be different depending on the subject and the level. Students receive one certificate for each subject they successfully pass. Foreign students who have completed Grade 8 in their national education systems. Our international curriculum offers a wide range of subjects to stimulate the students’ creative thinking and problem-solving skills as well as develop curiosity and lasting passion for learning. Students design their own curriculum combining the core subject groups of mathematics, science and English with over 30 language syllabuses, humanities and social-sciences subjects as well as more technical, practical and creative subjects. Students take a minimum of one subject from each subject group in addition to other subjects in line with their own interests. At the end of the 2-year programme, students take examinations in six subjects. Examinations take place in May and June of the second year. Tests are marked according to 8 grades: A*-A-B-C-D-E-F-G. If the test is not sufficient, the student receives a U, standing for “ungraded”. 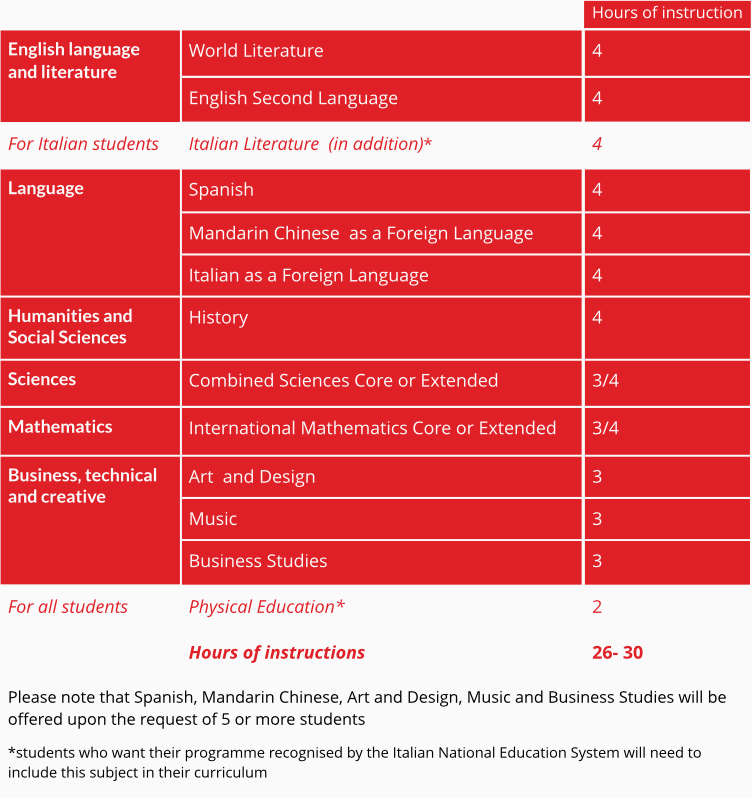 At the end of IGCSE, students have gained the skills and competences required to apply for pre-university programmes that last two years, such as the IB Diploma Programme.